Tenants in Bay View Apartments are fighting displacement despite passage of the Alameda Rent Ordinance that went into effect on March 1st, 2016. The Rent Review and Limitations on Evictions Ordinance is not protecting tenants from unfair evictions and allows landlords to create a climate of fear and intimidation. 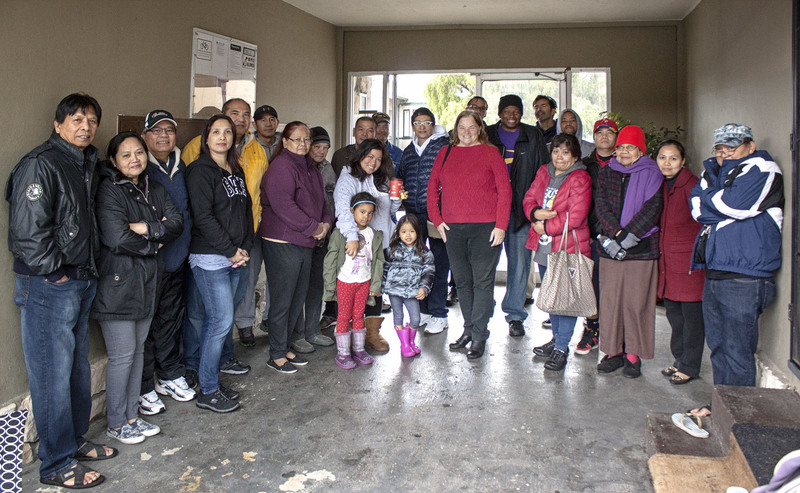 Tenants Together, the Alameda Renters Coalition, and Filipino Advocates for Justice will be holding a press conference at 10am today April 14th at Bay View Apartments 470 Central Ave. The landlord Matt Sridhar, CEO of San Jose-based Sridhar Equities, LLC, is determined to raise rents and evict all tenants in the building. Last year, he used a loophole in the original Alameda moratorium to give tenants at Bay View Apartments no-fault eviction notices. The tenants fought back and won. Now, he is using a weakness in the current tenant legislation to use the threat of eviction against tenants. The Ordinance allows 25% of tenants in a year to be evicted through no fault of their own. Some units are empty and under heavy construction, while the rest of the tenants are being harassed. Sridhar has used the construction as a tactic to harass tenants and make the community feel unsafe in their own homes. "I feel unsafe because our landlord’s construction crews are creating huge amounts of dust and not cleaning it up, using vacant units like hotel rooms, and fighting late at night. The other day I watched as construction workers threw a heavy bag from the 2nd floor which came within 5 feet of hitting a small child," said Mel LaGuardia, a tenant who lives at the Bay View Apartments with his family. Tenants Together, the Alameda Renters Coalition, and Filipino Advocates for Justice will be holding a press conference at 10am on Thursday April 14th at Bay View Apartments 470 Central Ave. to stand up against Sridhar’s harassment, and call for residents of the City of Alameda to pass stronger protections at the ballot this November. “This landlord is harassing tenants with the intent to make them leave their homes. The Alameda City Rent Review & Limitations Ordinance allows for unfair evictions. We will continue to see displacement in Alameda without stronger tenant protections.” said Leah Simon-Weisberg, Legal Director with Tenants Together. "Right now we are gathering signatures to put real Rent Control and Just Cause for Eviction Protections on the ballot in November. These policies are essential to keeping tenants in their homes," said Catherine Pauling of Alameda Renters Coalition. The press conference will be held in front of the Bay View Apartments - 470 Central Ave Alameda, CA 94501. Tenants and advocates will be available for media interviews.